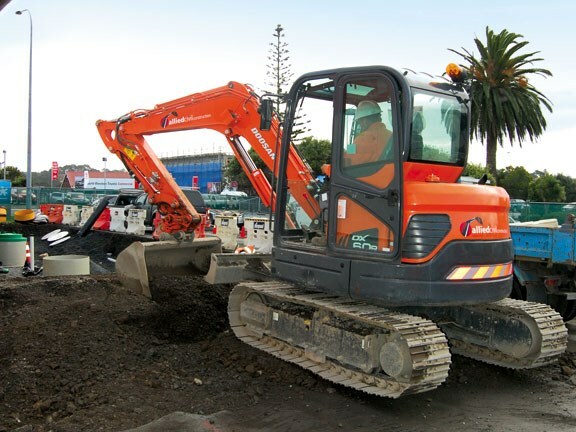 Auckland contractor Fuel Installations uses a Doosan DX255LC that was seemingly made for the job. 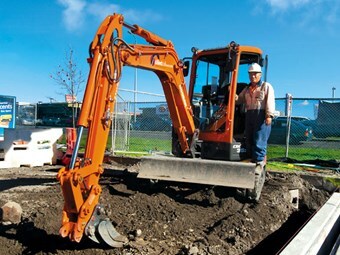 These Doosan DX255LC hydraulic excavators were built with operator comfort in mind. Operators spend up to 14 hours a day in their machines, so comfort is critical. But once the comfort box is ticked, the driver still has to have confidence that the machine will deliver the grunt required to do the work. The four Doosan diggers they operate for Fuel Installations pass both tests, say Big Fred Paraone and his colleague Fred Popata. Auckland-based Fuel Installations (FI), in operation since the 1960s, provides all the products and services needed to set up a petrol station and keep it running smoothly. That includes everything from complete turnkey service station construction to maintenance and upgrading of existing facilities. 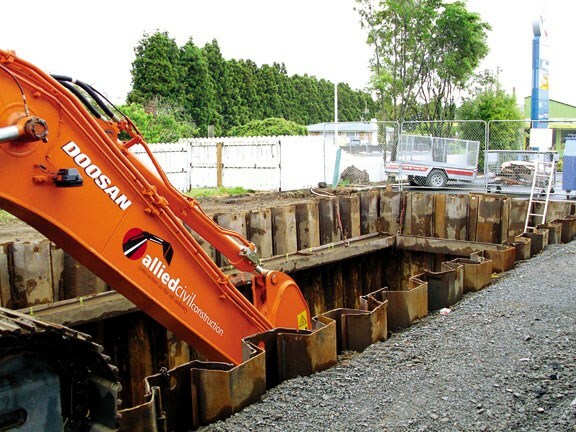 FI sister company, Allied Civil Construction, provides for all site civil requirements with an 18-strong fleet of modern excavators and specialist attachments, including the Doosan models DX35z, DX60R, DX80R, and DX255LC. The company works countrywide; it has built 10 new sites and upgraded more than 100 more in the past three decades. The two Freds have 34 years combined machine operating experience, 22 of them working for FI. Fred Paraone from Whangarei, with 26 years to his credit (14 with FI), is not only the most experienced operator on the 20-strong FI team, but has taught many operators the expert tricks of the trade over the years. Little wonder that when FI's sister company buys new plant, Paraone's input is valued highly: "I've seen them all, I've worked on them all. I've gone through them all from top to bottom. Over the years I've seen them develop from rather primitive equipment to the sleek, modern machines we have today. "I've been with FI a long time. I know the different applications we require on our jobs and I can measure our requirements against the capabilities of the machines on the market, how they perform. Over time I've developed a feel for these things," says Paraone. When Paraone gives advice on new plant acquisitions, an important consideration is that an XL-plus frame such as his will fit easily through the cabin doors and experience the cabin as spacious and comfortable. Although all four Doosans make the grade, his personal favourite is the two-year-old DX255LC hydraulic excavator, the machine on which he usually works. At the heart of the DX255LC is the new common rail Doosan DL06 engine, with four valves per cylinder. The engine, combined with the new e-EPOS electronic control system optimise combustion, results in grunty power, increased fuel efficiency and minimised pollution through reduced Nox and particulate emissions. The engine produces 166hp (124 kw/168 PS) at only 1900rpm as well as increased torque, which allows efficient use of the hydraulic system. Its principal work is sheet piling. It's set up for a compaction equipment breaker, a demolition crusher and a Movax sheet piler. CEO for FI, Bryce Bacon, says Movax in Finland specifically recommended the DX255LC due to the flow rate and power needed to drive the Movax vibo units: "With the space next to the cabin, the Doosan could accept the addition of a powerful hydraulic pack to boost the performance of the vibrating hammer. The competitively priced unit allowed for funds to allocate towards extra safety equipment on the machine." The additional safety equipment includes a front grille operator protector and reversing cameras. The DX255LC is currently in Gisborne awaiting another truck-stop construction project. Paraone is in Nelson retanking a Caltex retail site with the two-year-old DX80R. Towards the end of this month, Paraone will be reunited with the DX255LC to start constructing a new underground LPG facility for Vector in Gisborne. Paraone can readily explain his affinity for Doosan and especially his preference for the DX255LC: "I remember as a younger man working on machines with up to six hand levers and two sets of levers operated by foot. Every time you moved one, it would whack you in the knee. At the end of the day you would be so tired, you would not just be holding the levers, but choking them. "Today, the machines are much easier to operate, but tiredness remains something to look out for - operators can get carpal tunnel problems if they are not careful. We spend up to 14 hours per day in these machines. That's why driver comfort is so important." Paraone's job is mostly to build steel boxes for fuel tanks. One hole for one tank is about 12m long, 4.8m deep and 6m wide. It takes about three weeks to construct the hole and install the tank. "When we turn up for a job, usually the next one is already waiting. I get around the country a fair bit: I'm away from home about nine months a year. So a comfortable, strong machine is a real priority. 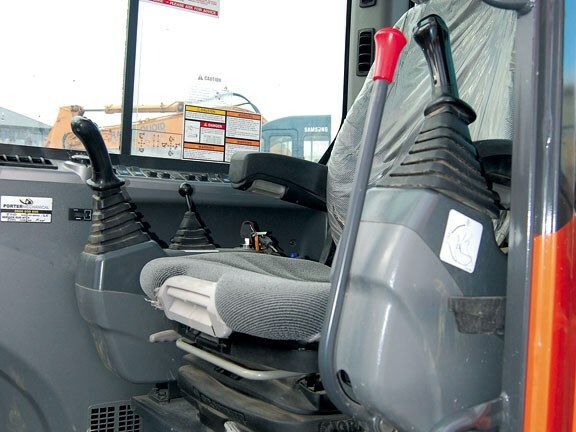 An important aspect of operator comfort is visibility. Today machines are much better designed, but there are still a lot of things crammed into a tight space, which makes visibility one of our biggest problems with diggers. "There may be people behind you, but you're so focused on the work, you don't look. In any event it's difficult to see people over two-and-a-half-metres of digger. Today, most diggers have a reversing camera as an optional extra, but in an ideal world I would like to see it as standard. There's enough stress in just getting the job done. It would be great not to worry about what's going on behind your back, too," he says. Paraone says the DX255LC has a wider-vision cab than any other digger he has operated: "You have to see it to believe it. I think the DX255LC gives the best operator access and comfort around today - I can get in and out without problems and stand the time I spend in it easily." The DX255LC is also Paraone's favourite because its sheer power cuts digging time by about eight hours per hole: "That's a big deal for us. 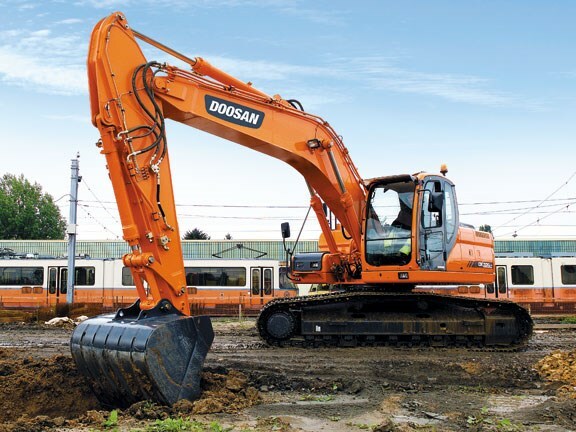 I gave the Doosan dealer some feedback about small changes I would like to make, such as stronger track motors, but all things considered this machine is superb." Fred Popata, from Auckland, is also very pleased with the DX60R that FI purchased 12 months ago. Popata joined FI eight years ago as rookie machine operator and is one of the team who learned the ropes from Paraone. He also remembers the late Earl Bacon, whom he considers as one of the best mentors he has ever had, with fondness. Popata is currently working with the DX60R on a job refurbishing a Caltex service station in Lincoln Road, Henderson. The Caltex site is on a major thoroughfare in a busy suburban area, and the FI team shares it with a team from another construction company building a fast food outlet. Space is at a premium: "The DX60R is a good little digger, especially around a workplace like this. Like my truck, a 1998 Mitsubishi Canter, it's just the right size for the job and delivers all the power I need. "It's nimble, can manoeuvre easily and do a lot of things in constricted spaces, such as under the 4m-high canopy. This one's all right - and it's nice and comfy inside to work," Popata says. The 5900kg DX60R is powered by a Yanmar 4TNV98-ESDB6 engine that delivers 37.6kW (50.4hp) at 2200rpm, with torque of 19.3-21kgfm at 1400rpm. It has a bucket capacity (SAE) of 0.175m3. Popata agrees that cab visibility can make all the difference in terms of operator stress: "What I appreciate most is that the DX60R gives good vision all-around. Ideally, all diggers should come with reversing cameras as standard. People think you see them walk behind you and that's the biggest mistake they can make. "You keep your eyes open, but have to focus on the work and don't necessarily see them, especially towards the end of a long shift. At the end of the day, I want to go home with all my friends." Popata is particularly pleased with his experience of the Doosans' service agent, Porter Mechanical: "A while ago we had a pipe break on the DX80R's hydraulic system. Porter Mechanical turned up fast and sorted it out on the spot. It was fantastic. If something breaks, you need to know the service agent will turn up when you need it. In our line of work, it's all about time and efficiency". 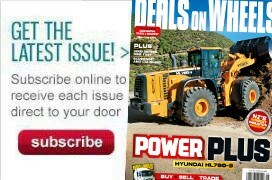 Bacon says Doosan is one of FI's suppliers of choice: "The sales process is simple, the aftersales service is second to none and Theo Valk, general manager of Doosan Construction Equipment, knows and understands the needs of contractors and why they want a trouble-free fleet." The brand new DX35z was recently delivered to FI in Waikaukau Rd, Glen Eden. What features of this machine impressed the FI team in particular? Says Bacon: "The reasons we buy Doosan are simple - it's a good, reliable product and the back-up is there when you need it. And as Fred says: "No good getting me anything other than the Doosan 35, because I won't fit in anything else!"